This Article Discusses The Number One Way To Lower Heating Costs. Al’s Plumbing, Heating & A/C in Plano, Texas provides maintenance & repairs for all brands of Central A/C, Gas & Electric Furnace, and Heat Pumps. Additionally we sell and install new HVAC Systems from American Standard (same company as Trane), Ameristar (same company as American Standard) and Coleman HVAC (same company as York HVAC). Al’s also provides full service plumbing maintenance, repairs and replacements for every plumbing component in your home. Al’s sells and installs Rheem Professional Series gas & electric water heaters, and tankless water heaters. Al’s is near your home in Plano, Allen, and Frisco. We service all homes in southern Collin and Denton Counties with no travel charges. Call Al’s today to discuss any concerns or problems you have with your HVAC System or Plumbing. We will arrange an appointment at your convenience and offer 24/7 Emergency Service. AlsPlumbing.com Lower Heating Costs – 20 Uncommon Ways. Increasing Attic Insulation Will Lower Heating Costs Somewhat To Tremendously. base on how much currently exists. When needed, adding attic insulation is the best energy-saving home upgrade possible! Older DFW homes did not have nearly enough attic insulation installed when the home was built. 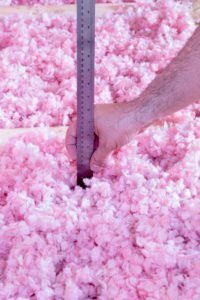 We detail the insulation building codes for TX over the years below. Attic insulation keeps on giving forever. Once installed, it will lower heating costs (and cooling costs), eventually paying for itself through energy-costs savings. Plus it makes the home quieter. Heated air rises, so the warmest place in the rooms is at the ceiling. In winter, attic temperature will be slightly warmer than the outdoor temp on sunny days. Attic temp will be nearly as cold as outdoor temps during the night. Lower heating costs will be achieved with adequate insulation. Attics have 24/7 ventilation to remove humidity. If your home has “turbine vents” you can see them turning in the winter during the day. Cooler, outside air is brought into the attic through openings (typically near roof peak / gable as shown below). 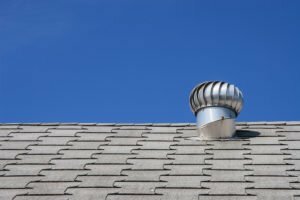 In winter, it’s not possible for attic temps to rise notably above outdoor air due to the attic having cool outdoor entering the attic 24/7. 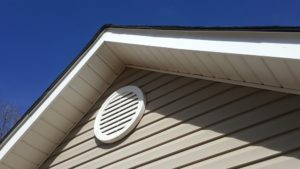 Note: New homes have attic ventilation, but most don’t have turbine vents. If your home’s temperature was 70F degrees overnight on on Jan 12, 2018, the warmest place in the rooms was separated from an attic by only a layer of drywall and inadequate existing attic insulation. Homes with too little insulation has furnaces running far more than those with adequate insulation. If the home has electric heat, the cost was even higher. In summer, DFW attics can reach 160F degrees during summer. Attic insulation has more impact as the best way to lower heating costs. Only the top 2-3 feet of the walls touch the warmest air in the room. If you have ever wondered why your heating & cooling costs in an older DFW home are so high, the most significant reason is inadequate attic insulation. Add attic insulation to lower heating costs, cooling costs and make the HVAC System last longer. The higher the R-Value, the more insulating ability provided. Today Texas requires R-38 attic insulation & R-15 wall insulation in newly built homes. It’s common for workers to kick insulation out of their way while working in the attic. It’s likely blown insulation has settled some over the years. TIP: When adding insulation, ask the contractor for R-38 bid & R-60 bid. The additional charge may be less than you expect. It costs the same amount of money for the contractor to come to your home and set up + tear down the equipment. The contractor’s additional costs are for more insulation material + nominally larger labor costs. Additionally, insulation (exceeding the R-38 minimum) will result in increasingly lower heating costs. Insulation will pay for itself in a few years in the form or both lower heating costs and cooling costs. Less demand on the HVAC System makes it last longer. Why Choose To Insulate Above R-38? Reduction Of Noise Coming Into Rooms From The Attic. Lower heating costs is the primary reason to add attic insulation. A free side-effect comes in the form of a quieter house. Adding attic insulation helps to reduce the noise coming into the living space through the ceilings (such as air-traffic over your home). STC is a numeric rating of how a building product reduces airborne sound. An R-38 insulated ceiling would have about 1/2 less noise transfer (into rooms below) than an attic with no insulation. An R-60 insulated ceiling would have about 2/3 less noise transfer (into rooms below) than an attic with no insulation. STC 55+ is considered excellent noise control. NOTE: If adding attic insulation does not provide the level of noise reduction you desire, your money is still well spent due to lower heating costs. We show R-Values of blown attic insulation above. If you don’t feel insulation above R-38 will lower heating costs enough to justify the extra expense, consider if you hear air or road traffic noise in your home. Noise coming into your home through your attic can come from a number of sources. The most common are Air-Traffic Noise (depends on where you live within DFW) and Road-Traffic noise. The U.S. Department of Defense (DOD) determined that noise level below 65dB is generally compatible with residential development. At 65 dB & higher, homes need varying levels of sound insulation treatments to ensure noise levels inside the house are sufficiently reduced. U.S. Dept. Of Defense (DOD) determined noise level up to 65db as compatible with a residential neighborhood. Planes fly overhead 16 times per hour during the daytime at Love Field Airport. Click Below To See Noise-Contours Map For Love Field & DFW Intl. Highway traffic noise is typically 70 to 80 dB at a distance of 50 feet from the highway. Most people prefer noise level inside their home to be no more than 45dB. Exterior Doors & Windows allow the largest noise-transfer into your home — but they are a small amount of the home’s exterior surface. STC-40: Detached Home Roof with Common Asphalt Shingle Roofing Material. STC-45: Detached Home Roof with Clay Tile Roofing Material. STC-34: Detached Home Roof with Wood-Shake Roofing Material. If you have attic insulation at R-38 or higher, and you still hear too much noise coming through the ceiling into the rooms, consider additional sound-reduction at the room’s ceilings. Sound Absorption: A Porous material which acts as a ‘noise sponge’. This can be increased by adding more fiberglass insulation in the attic. Sound Blocker: A dense material that allows less noise to travel through it. This is often done by adding additional layers of drywall to existing walls. This can also be a solution for ceilings in a home with excessive overhead noise-transmission through the ceilings. Mass Loaded Vinyl (MLV) barriers are composed of salts, sands, & tiny metal particles that give it sound-absorbing properties. MLV soundproofing adds dense mass so sound waves are increasingly blocked from passing through ceilings & walls. Mass Loaded Vinyl has an STC of 20 and up! SHOWN: Mass Loaded Vinyl with STC 27 rating. For New Walls: MLV is applied beneath the drywall & covers the insulation and lumber inside the wall. Existing Walls: Mass Loaded Vinyl can be installed over existing drywall, and covered with a 2nd layer of drywall. Existing Ceilings: Add a second layer of 5/8″ drywall + MLV (applied to the drywall just before installing it) would create tremendous noise-transmission reduction. Typical residential interior wall just below. The Mass Loaded Vinyl Product Shown Above Doubles the STC to 54. The problem with insulating an attic ceiling is moisture potentially becoming trapped. If the roof ever leaks, moisture can be trapped within (fiberglass) insulation or between (foam) insulation and the wood roof-deck (what the singles are nailed to). In existing homes, the potential risk likely outweighs the benefits. The attic is ventilated when the home is built. Unless you choose to seal the attic, you will not achieve notably lower heating costs by insulating the attic ceiling. Additionally, sealing attics requires ensuring humidity does not get into the attic from the living space, which requires additional sealing efforts. In the Sun-Belt, a generally accepted energy-saving improvement for the attic ceiling is a Radiant-Heat Barrier. It can be painted on, or a FOIL attached to the bottom of the lumber the roof-deck is nailed to. It will be left open at the top & bottom so hot air can rise between the foil and roof deck. The heat rises and is removed by the attic ventilation located at the top of the attic’s ceiling. While a radiant-heat barrier doesn’t lower heating costs in DFW, it will notably lower cooling costs. Al’s also provides full service plumbing maintenance, repairs and replacements for every plumbing component in your home. Al’s sells and installs Rheem Professional Series gas & electric water heaters, and tankless water heaters. Al’s is near your home in Wylie, Murphy & Rowlette. We service all homes in southern Collin and Denton Counties with no travel charges.